Santa Rosa Lake State Park campground has 75 campsites for tents, trailers and RVs in too loops (Rocky Point and Juniper Park). Twenty six (26) of the campsites have water/electric hookups. Each site has a table, fire ring and grate. The campground has drinking water, flush and vault toilets, showers and a dump station. Primitive camping is also available in the Los Tanos section. Our favorite Santa Rosa Lake State Park campsites are: Juniper 4 and 11, and Rocky Point Loop B 4. Santa Rosa Lake State Park includes 500 acre’s of land with low rolling hills dotted with juniper and pinyon trees. The 3,800-acre Santa Rosa Lake is the largest of several area lakes, and was created to tame the wild Pecos River. It offers beautiful views, great fishing and other outdoor activities including boating, water sports, swimming, canoeing, kayaking, picnicking, hiking, biking, horseback riding and wildlife viewing. That’s a lot of ING’ing going on! Another nice State Park in the area is Conchas Lake State Park. It’s about 56 miles north east via Highway 40 east and 129 north. The campground there has 105 developed campsites and hundreds of primitive campsites. Juniper 4 and 11, and Rocky Point Loop B 4. Visted Santa Rosa Lake State Park Campground lately? We'd love to hear about your adventure. Did you find us useful? Did we forget something? 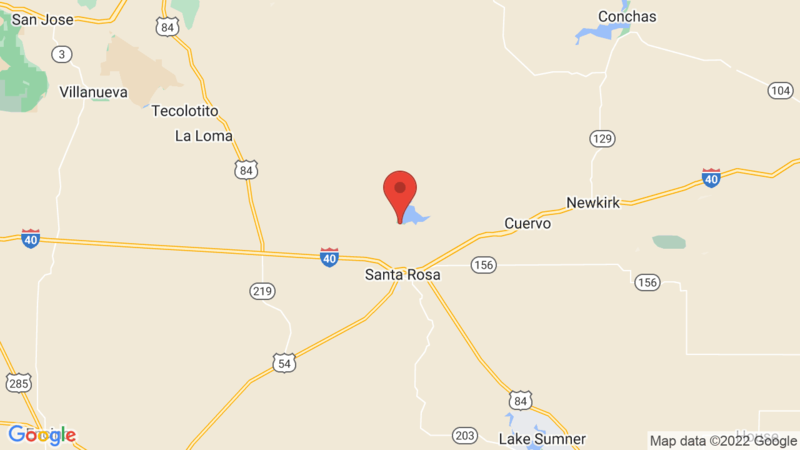 Anything our community should know before heading out to Santa Rosa Lake State Park? A couple of week ago i was driving west on highway 40 about 4:30 in the morn for many miles near Santa Rosa and i keep looking north over the mnts. At light brighter than the sun coming up behind me. Was that the lake area ? Hard to say! It might have been a reflection of the lake. I just wanting to know if they had fished working on the camp grounds. and if they had put more hook ups to site i want reservations there ? Not quite sure if I understand, but you’d probably need to check the fishing report for the area – to see if the fish are biting. And there are about 20 sites with electric hookups. Pretty unprofessional when a park ranger takes the only “walk up,” pull through, campsite that has Electric and water. (He’d been there for over a week). If a ranger has to stay in the campground, then he should take the less likeable site. Btw, he only slept there.